Why is Highbury Corner no longer a corner but a traffic roundabout? It is the result of the deadly explosion caused when a V1 flying bomb fell at 12.46 p.m., on 27th June, 1944. V1 flying bombs were mostly launched in salvoes, with ramps at several sites launching at once. The idea behind this is that with more targets to shoot at, the probability was increased that more bombs would make it through the south of England gun belt undamaged and go on to reach London. There is also the matter of speed. V1s actually had a significant variation in speed depending on the efficiency of each individual engine. For this reason, the time from launch to impact in the target area could be anywhere between 20 - 40 minutes (although this is partly dependant upon exactly where in the target area it came down). For example, on 16th August, 1944 a salvo was launched from several French sites at 09:23hrs and one bomb from this salvo impacted in north-east London at 09:56hrs. 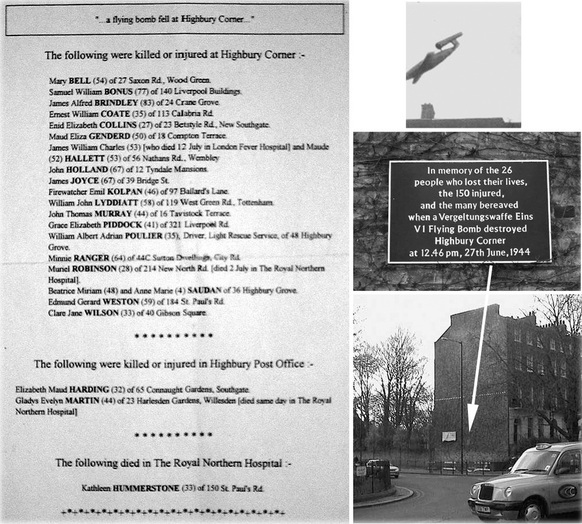 Therefore, the V1 flying bomb that landed on Highbury Corner during the lunch hour on 27th June 1944 may have been launched at approximately 12:15hrs on that day. 26 people lost their lives, another 84 were seriously injured and 71 slightly injured. Following is a summary from the Civil Defence Organisation, Metropolitan Borough of Islington, Air Raid Damage Report. Dated 27th June 1944 (Tuesday) Fly Bomb Highbury Corner. Functioned at Junction of apex of Green with Compton Terrace, Upper Street and St. Paul's Road. Compton Terrace: Demolished No. 34 & 35. Partly demolished no 33. Badly damaged 32 & 37. Surface shelter FK1 situated in Green opposite No 35, roof collapsed. St. Paul's Road: Partly demolished; even no's 324, 326 & 328 Seriously damaged, even No's 310-322 inc. Holloway Road: Partly demolished No's 1 & 3. Seriously damaged Highbury Station LMS Railway No's 5 & 7 Upper Street: Demolished No's 253, 255 & 257. Partly demolished No's 251 & 259. Seriously damaged 243, 245, 247 & 249. Damage by blast to windows, doors etc., in surrounding thoroughfares. 2) "We met every day to go to lunch at Highbury Corner, usually to the Express Dairy Co. One particular lunchtime I said to her, come home for lunch today for a change and I will cook us Spam fritters.... that strange quirk of fate probably saved our lives." 3) "By late 1944 I was a student attending the Northern Polytechnic in Holloway Road. One day, during a break, I nipped out to buy myself a snack from one of the shops near Highbury Corner. As I approached the Tube Station, I heard the dull drone of a German Doodlebug rocket passing overhead, I looked up but couldn’t see anything. At that same moment the engine cut out and I made a dive for the ground — too late, I didn’t make it and was bumped around by the blast like a rubber ball. “I picked my self up in the swirling dust and climbed over what seemed like a mountain of rubble and twisted trolley-bus lines in a complete state of shock. The entire front of the local bank had been destroyed and pound notes were blowing about in the wind like confetti. On one side there was a tram cut completely in half by the explosion. “I felt like a zombie and just started to walk back through the wreckage towards the college. I passed a woman whose back had been pierced by a large piece of the rocket’s fuselage. It had impaled her body to a wall - she was still alive and called out ‘help me!’ But I just passed by and kept on walking — to this day I carry the guilt that I didn’t stop and hold her hand as she died — my only excuse was my state of total shock.” Victor Brown, BBC, WW2 People’s War. An archive of World War Two memories written by the public. 5) ”I was always fascinated by my mum telling me what happened to her one day as she was wheeling my two sisters towards Highbury Corner, Hackney, (sic) London. She had one of those huge prams that everyone had in those days and sat at either end were my sisters Valerie and Joan. “She said that as she walked along towards Highbury Corner to meet a friend in a cafe at the end of the road, a cafe where mother's used to sit and feed their babies and chat with friends, she heard the dreaded noise of a Doodlebug. Standing quite still she looked up and to her horror realised the sound was coming in her direction. Looking around she couldn't see anywhere she could run to for shelter. So instead took my sisters out of the pram. Sat the two of them on the pavement and turned the pram over the top of them to act as a shelter. Then sitting down next to it she waited. “As she did she saw the Doodlebug fly over and could see the flames coming out of the back of it. Then it's engines cut out and she shut her eyes and waited. She said there came an enormous explosion from the bottom of the road and debris flew along the street in her direction. But she and my sisters were safe. “The Doodlebug hit Highbury Corner and killed loads of people. Mum never would go into too much detail of how many and who, except that the Doodlebug flattened the cafe with the mother's and children in it. The strange thing was that as they heard the Doodlebug in the cafe my mother's friend stood up and she was still standing unhurt when she looked around at the devastation around her. 6) ”I was a seven year old when that V1 landed on the bank at Highbury Corner. I was in Miss Keats news shop on St Pauls Rd opposite Compton Rd with my Mother. We heard the buzz bomb cut out and Miss Keats took us through a door that led to some stairs which led to the basement. We cowered on the stairs waiting for the inevitable. “The explosion blew out the shop windows and I can remember the dust and people running. Sad to say, the fiancée of Miss Keats was just leaving the bank when the doodlebug hit. He was killed outright as we found out later. 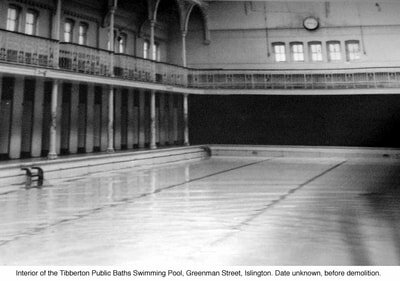 Tibberton Square Public Bath, Greenman Street, Islington, London. “In the mid 60s, the pool was known locally as the 'Tib'. The premises comprised a mixed bathing pool with spectator gallery with individual changing cubicles down each side for males and females. The mixed pool was about 30 yards by 10 yards, 3ft. shallow water and 6ft. deep water. It had a stepped diving stage that was removed in 1964. 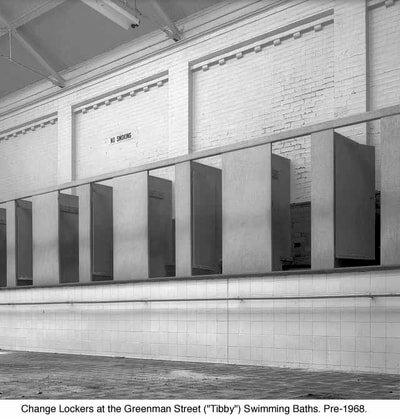 There was also a dedicated men only pool, with 80 small cubicles each side, no doors, only wooden seats, slate divides and a small wooden angled slatted section above for clothes. There was a small attendant's room and separate shower room and toilets off from this. The ladies only pool was about 20 yards by 10 and had cubicles on both sides with doors. There was also a ladies' warm [slipper] baths located over the ladies' pool, plus a men's warm [slipper] baths located over the men's pool. The main entrance had a Superintendent's office off to the left as you entered and an enclosed ticket office on the right. Walk on and you were in the men's pool, stairs on the left led to the men’s warm baths. 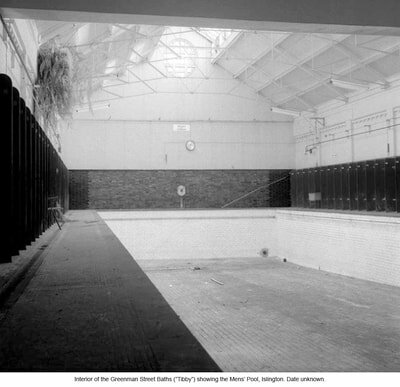 A doorway on right right led to the mixed pool through a vestibule. There was also stairs to the public laundry on the left next to the stairs to the basement. A remedial suite on the first floor comprising of 2 beds, a large bath with a air extracting contraption that when placed in the bath caused bubbles to rise under one. There was a very large public laundry with individual sinks and drainers and pull-out drying horses. There was an establishment laundry which served to wash and dry the used hired towels and staff clothing. This was located in the basement. The main gates were off Greenman Street and there was a large entrance yard about 30 yards by 30 yards. 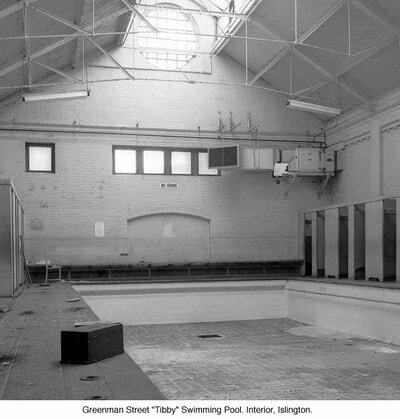 To the right was a lock- up store for visitors cycles that also led to the mixed pool public gallery. On the left of the yard were steps into the boiler room and basements areas. Contributed by Peter Stechman, former Sports Centre Manager at the Oasis, Holborn [1968-1991] and former Barnsbury School for Boys student.